CARLINK is a telematics system by CARLINK that connects your vehicle's remote starter to your smartphone. 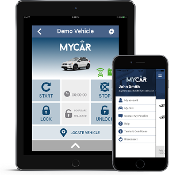 MyCar can also provide your vehicle's location and alerts related to your vehicle's location and security. The CARLINK smartphone app is available today in the iOS App Store and Google Play store. It is compatible with all iOS and Android devices, including today's high-resolution devices.